When it comes to paranormal horror, The Ring is in my book as one of the scariest movies ever made. The premise doesn’t sound too scary at first — everyone who watches a particular video tape dies within a week of viewing the tape. Naomi Watts plays Rachel, a reporter who is investigating a string of deaths that seem to be connected to the tape, and she is definitely skeptical at first. But what is on the tape is inexplicably creepy. And then things start happening, and people start dying, and all of a sudden, Rachel is racing against time to save not only herself, but also her son. That freaky girl with her long dark hair all in her face. I watch a lot of Asian horror — this movie is actually a remake of the Japanese Ringu — and the Japanese seem to have something going on with hair. There’s even some mythological history about hair demons. I’m not sure why hair, or hair covering her face, is scary but it works. The stop-motion filming that makes the creepy girl almost jump toward you as she’s coming out of the well, or crawling out of the TV set. Also, her arms and neck work at odd angles. It’s just not natural and I don’t want it coming at me quickly and with purpose. Ack. I think, though, what bothered me most about the movie was the faces of the people who died of fright. All purplish and distorted, and you only get a quick glimpse of them – not long enough to really figure out everything that’s wrong, but quite long enough to make a lasting impression of “oh crap”. Just the idea of the way the curse works. Being targeted simply due to viewing the recording, regardless of who you are or how you came across the video. The potential for accidental cursing wakes up that fear of punishment for unintentional transgression, something that is rooted deeply in us from childhood. Also, the lack of recourse — there’s no way to turn back or change your fate. This is an unforgiving evil, one that doesn’t care about excuses and which is simply angry and ready to strike out and punish anyone within its range. The predatory nature of the force unleashed by the tape, combined with the sure, slow stalking of the victim to a known date death, creates a torturous situation full of dread and completely lacking in the possibility of mercy. If you haven’t watched this movie yet, just know that once you do the following week is going to be pretty rough for you. I have a special affinity for foreign horror, and so I got pretty excited when I started seeing trailers for Rigor Mortis. This Chinese movie definitely takes a different twist on the vampire! The protagonist is a former actor who moves into an apartment building where typically only those with a much lower-class lifestyle live. The building is full of odd characters: the seamstress and her husband, the flashy guy who runs the nearby café, the security guard who knows everyone, and the homeless woman and her child who roam the halls. As soon as our protagonist moves in, it becomes clear that he is not planning on being there long. His suicide attempt is cut short by Mr. Flashy, and in doing so we find that his apartment is haunted by the spirits of two women. The spirits haunt the building, searching for a body to inhabit. And, a body is soon provided as the husband of the seamstress falls to his death on the concrete stairs. In her grief, the seamstress resorts to black magic to revive her husband, burying him in dirt in the bathtub, interring him in a coffin that hangs above the ground, and covering his face with a special, creepy metal mask, which she is instructed to never remove. From there, things start getting crazy, and our protagonist finds himself teaming up with a vampire hunter to save the day. This movie has some great visual effects, especially the two women spirits who are surrounded by numerous blood red tendrils, and who creep around on the walls and ceiling, while trying to find a body to possess. The cinematography is great – lots of dark, rich colors and noir lighting. There are also some interesting choreographed fight scenes, and some tools of the vampire hunting trade that are pretty cool. One of these allows the hunter to change reality within a certain area and cycles through the different Chinese elements: fire, water, and earth. I definitely enjoyed this movie. 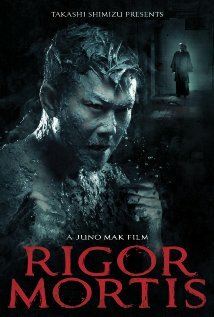 If you like foreign horror, especially movies that have a combination of action and horror, then you would probably enjoy Rigor Mortis.